Ciatti's roots in the California Wine industry span over a half a century. In 2006 Joe Ciatti retired. A new ownership group carries on with a blend of considerable experience and a fresh vision for the future. Ciatti is the largest and most comprehensive bulk wine, juice and grape brokerage in the world. With 8 offices world wide, Ciatti serves our clients with the most up-to-date and accurate market information available. Please contact us with any questions. We are truly at your service. Greg joined Ciatti in 1994 and became a partner in 1997. Greg has used his degree in International Relations to build Ciatti into the world recognized leader in the alcohol beverage business. Greg is currently the President and CEO of the company and drives the international group. Steve Dorfman joined Ciatti in 2007 after working with the Brown-Forman Corporation, Fetzer Vineyards, Sonoma-Cutrer Vineyards and Bolla Wine brands for 24 years. His primary responsibilities are wine and grape sales within California, and the supply demands of markets throughout Europe, South Africa and Australia. John Ciatti started with the company in 1982 and became a partner in 1986. John has always maintained a strong presence in all areas of the Domestic US Ciatti business. He specializes in spot and contract bulk wine and grape sales from all regions of California. John also works very closely with the fruit and grape juice concentrate division, looking to develop specialty products for the food and juice industry. John values the insight and knowledge that brokering affords and thrives on using that information to create sales at all levels of our industry. Ciatti has a long history of seeking to provide clients with a well rounded team of brokers whose experience in the industry cover the breadth of the business. John joined the company in 2003 after working as a Winemaker for several of California's major producers for 20 years. John's emphasis is maintaining relationships with California wineries ranging from the largest to the smallest. John has focused on all aspects of growth within the business, from long-term custom crush contracts to spot bulk wine and grape sales. His speciatly is the sourcing and selling of premium varietal lots from the coastal and interior regions of California. Chris Welch joined Ciatti in 1994, and began brokering bulk wine and grapes in 2003 and became a partner in company in 2007. The premium and super premium segment of the California wine industry are the breeding grounds of innovation and where Chris truly excels. His consistent approach helps small and medium size wineries and negotiants achieve the innovation and growth they seek. Chris also works very closely with the Oregon Wine Industry. Glenn Proctor joined Ciatti in 2003 and became a partner in 2007. Glenn advises wineries on supply positioning and works closely with growers and wineries in marketing their grapes and wine. He specializes in spot and contract bulk wine and grapes sales from all regions of California. He has over 23 years of experience in wine supply strategy, wine-grape quality improvement, brand strategy, and business development. Glenn was previously the Vice President of Winegrowing for Diageo Chateau and Estate Wines, and before that was a Director at Benziger/Glen Ellen Winery during its rapid growth in the early 1990's. Johnny Leonardo joined Ciatti in 2004 as a broker and knows that surviving in a dynamic wine industry requires one to be a Jack-of-all-Trades. He has experience in all aspects of winery and vineyard operation, from the field to the street. Johnny has developed and managed vineyards, and worked in wine sales and marketing. Andy joined Ciatti as a broker in 1996. His areas of expertise and responsibility include grape and fruit concentrates, beverage and industrial alcohol, fruit alcohol and brandy, and food specialty products. Andy's knowledge of these products has allowed him to branch out and work throughout various parts of the world including Mexico, South America and Europe. Andy remains a wealth of knowledge and offers a creative approach to all endeavors. Todd Azevedo joined Ciatti in 2004 after completing his Agricultural Finance degree from Cal Poly San Luis Obispo. Although Todd brokers wine, grapes, and wine products throughout the state of California, Todd's focus is on the California Central Coast. Ciatti is committed to providing you with all your wine and drink making needs. Whether you are after 5 gallon pails or bulk tanker quantities, we can help find the right product for your needs. Ciatti specializes in brokering bulk wines, and uses this expertise and knowledge to be the world's largest wine brokerage company. We use our local and global knowledge and extensive network to bring growers, suppliers and end-users together.With eight offices located around the world representing all major wine growing countries, we can offer global supply solutions to an extremely diverse international client base. We have built strong relationships with all of the world's major wine companies. We are recognized internationally for reliable information and extensive bulk wine inventories, in both volume and quality. Our goal is to provide the best information, experience, inventory and service in the global bulk wine market. As we are a pure brokerage company, we take no position on the wine so you will be guaranteed the best unbiased opinion on quality, price and demand. Ciatti recommends that customers take advantage of the wine sample system to assist in finding the perfect wine. No matter what volume of wine you are looking for we can assist in finding the perfect match for your requirements. We work with all valued customers to develop required wine specification details, which can later be used to form part of the purchase terms. The wine brokers operate within individual markets, but their global knowledge they can help source wine styles and prices from our global inventory. Once we are aware of your wine style requirements we will organize samples for style approval. Ciatti negotiates both spot market and long term bulk wine contracts. We are responsible for matching the needs of the buyer with the available supply options from a diverse range of producers. This enables buyers to diversify their supply risk. Ciatti provides an independent wine evaluation and appraisal service to the wine industry. This includes feedback to suppliers and producers on the quality, marketability and current demand in the marketplace of their wines. The tasting panel consists of wine professionals associated in various roles in the wine industry (Winemaking, Sales and Marketing) who are able to give opinions on quality and current demand for the wines both domestically and internationally. Wines are tasted and analyzed so we can provide detailed tasting notes, as well as a guide to demand and price range for the current market conditions. If needed, our staff can answer questions or provide further information before the tasting occurs. Once completed Ciatti is happy to discuss the outcome with the supplier or producer. Ciatti can help source or sell grapes prior to and during vintage time. All of our brokers have extensive knowledge and relationships in the domestic markets, and they utilize this information to find the perfect buyer or seller for your requirements. Grapes can be sourced from any growing region, which ensures the perfect parcel can be found for any situation. Please don't hesitate to contact your local office to discuss any of your grape needs. Sourced from California, Argentina, Australia, Chile, Italy, Spain and South Africa, we can fill your standard white grape juice concentrate requirements. Whether you're looking for crude, standard, organic, extra light or Kosher certified we have you covered. Sourced from California, Chile, Australia, Italy and Spain, Ciatti can source red juice concentrates of every colour intensity for your needs. These products are also available in crude, standard, organic and kosher. Available specifically in the US, we can source Mega Natural (R) 8000 colours in red, purple and cherry. We can also assist in Grape Juice Concentrate 8000 in red and purple. Also available Grape seed extracts, hi proof grape spirits, brandy, (aged and unaged), grape oils and flour and pomegranate essence and arils. For any queries in the US, please contact our concentrate specialist broker Greg MaGill. If you have any global concentrate or juice enquiry, please contact your closest Ciatti Office. In the past four weeks the picture on the Southern Hemisphere’s 2019 harvests has sharpened into focus: the crops in Australia, New Zealand, Chile and South Africa appear to be down on their respective averages to varying degrees; only Argentina looks like having been untroubled by heat and/or drought conditions past or present. The Western Cape’s harvest, according to latest SAWIS data, is coming in even smaller than the significantly short crop of 2018, a hangover from the three-year drought that ended last year. Lack of rainfall has also been of concern in southern France, Spain and Italy, as growers move into the vineyards to prepare for the 2019 growing season. Castilla-La Mancha’s vines will start the season tired after last year’s bumper output and the subsequent dry winter. April has brought rain to southern Europe’s growing regions, but in most cases not enough to recoup the winter shortfall. The forecast in southern France is for a cold and wet mid-April – both a source of hope and worry for growers as budbreak is underway and the frost risk remains. On 6-7th April, a hail layer several centimetres thick was deposited on areas between Montpellier and Nîmes. This report has been relaying much unusual weather in the past 8-9 months that potentially makes the bulk wine and grape markets harder to predict. 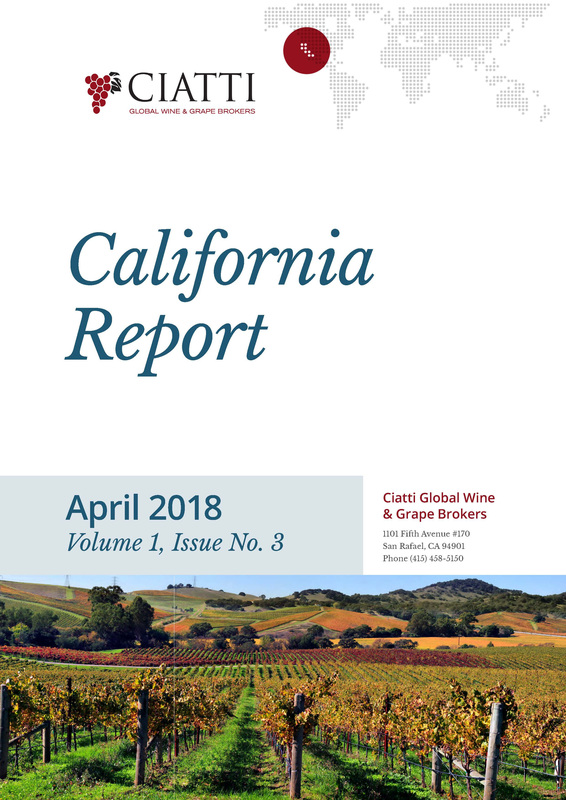 Ahead of the USDA’s 2018 grape crush report, published Wednesday April 10th, this month’s California Report provides an update on current conditions in Californian’s vineyards and bulk market activity. Stay tuned on the 10th for our press release responding to the crush report, then May’s instalment of our California Report will delve deeper into the crush report’s findings. The big weather news is: for the first time in 12 years, there is no region in California under a drought watch or warning. Winter has been cooler and wetter than average, particularly in the northern half of the state (and as far south as Paso Robles). In Northern California rain has stayed in the forecast through March and into the first half of April as well. The late spring rain in Northern California has delayed budbreak with many areas reporting budbreak occurring later than normal. The wet conditions in the vineyards is also delaying handwork. Growers are keeping an eye on fruit set and bloom. The Central Valley has been drier than the Coast but Sierra Nevada snowpack was at 161% of normal by the turn of the month, the fourth highest level in the last 40 years. The bulk wine market across California registered a small uptick in activity in the past four weeks. With prices softening to their lowest level in five years, the Coast saw some opportunistic buyers move onto the market in search of small volumes of 2017 reds such as Napa Valley Cabernet, as well as Sauvignon Blanc, with which to start new Coastal brands. Lodi and the Central Valley, meanwhile, has seen activity on 2018 Pinot Grigio, Chardonnay and Sauvignon Blanc from longstanding buyers who have come onto the market a few weeks later than normal, suggesting the 2017 whites took a little extra time to work through. We have seen buyers looking to renegotiate grape contracts to reflect the price softening on the market. In addition, the potential has opened up for ‘California’ appellation program owners to – temporarily at least – up the proportion of Coastal appellation wine going into their blends without the need to change their cost structure, or at least slow the reduction in their use of Coastal wine. We are also seeing a ‘just-in-time’ business model on bulk wine purchases, with buyers seeking quick turnaround times between sealing the deal, taking possession of the wine and bottling it – indicative of an inventory build-up making storage space difficult. In general, wineries still have inventory and many are putting the excess back onto the market. Spring is getting underway in the Northern Hemisphere and the show season is upon us: ProWein, China Food & Drink Fair and Vinitaly are all imminent while IBWSS London will have just ended by the time you read this – Ciatti will of course be present at all. ProWein will provide the first big industry get-together since the World Bulk Wine Exhibition in Amsterdam last November and – with the Southern Hemisphere’s harvests now concluding and the buying campaign on the 2018 Northern Hemisphere wines in full swing – it will help provide clarity on the global bulk wine picture. The picture at the moment is mixed: the overall trend is slower buying activity and softer prices after the big 2018 harvests. This trend is not a uniform one in each market, however: in Italy, for example, activity on international varietals and generic reds is more normal, with only the generic white market slow; in France, organic wines are sold out and the best quality varietal reds and whites are moving quickly; there is a good level of activity in Australia; the Western Cape market, meanwhile, has been quiet because its 2018 carryover stock was almost completely sold out months ago; Chile’s prices are showing a slight upward tendency. In short, it is perhaps an oversimplification to say there is a glut of bulk wine around the world right now: instead, activity has returned to something like a normal pace after more feverish markets in 2017 and 2018, and buyers seeking specific, good quality wines need to be just as attentive as they’ve always been. Ciatti is seeing the slowest market since 2010 for Californian winegrapes and bulk wines, off the back of a pull-back in demand and increasing inventories since 2017 (compounded by a record crop in 2018). We have recently seen downward adjustments on most, if not all, prices – albeit from record highs – as sellers start to realize the new market reality. Realizing that in some cases the first offer is now the best offer, bulk sellers are keeping more of an open mind when receiving offers than maybe they have done in recent years. This realization has helped generate renewed buying activity on 2017 wines – reds in particular and Cabernet especially – from opportunistic négociants seeking short-term deals to supply a potential buyer, whether that be a retailer, a private label, a short-term label, or someone else. These buyers have an eye for opportunity, such as the potential of sourcing some Coastal wines at California appellation pricing – they have had some success at this with those sellers seeking to move small volumes in order to make inventory adjustments or boost storage space. (Because of the large inventory, there have been early conversations about capacity ahead of the 2019 harvest, especially on Cabernet.) To reiterate, these are small volumes: most Coastal wines have high fixed costs built into them that preclude them from being priced competitively versus California appellated wine. 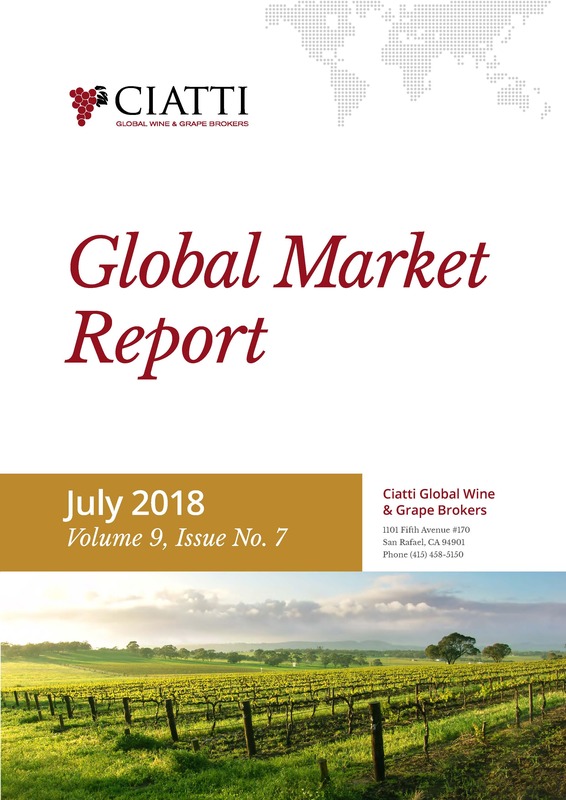 “The large 2018 global harvest is starting to create a fundamental shift in the availability and pricing of wine,” Rabobank reported in its latest Wine Quarterly, “and this is set to have a profound impact on trends in 2019.” Ciatti agrees: it could be said the bulk market has returned to normality after the shortfall blip in 2017 and early 2018 created by the very small 2017 global harvest. France, Italy and Spain drive global demand swings and the other countries react: Europe’s average-sized 2018 harvests and reduced pricing has led to a downward price adjustment in Chile, while Argentina – assisted by the peso devaluation – has cut even further to generate interest: its basic generic white is priced at USD0.22/litre. Lower prices around the world have not led to a sales frenzy: with plentiful volumes available, buyers continue to weigh in their options. There have, after all, been few worrying noises emanating out of the Southern Hemisphere about its imminent 2019 crops. That said, severe summer heat in Chile (up towards 40°C) and obscene heat in Australia (up towards 50°C) remind us that Mother Nature always has a say. As 2019 begins, we at Ciatti wish all of our friends, clients and business associates a very happy and prosperous year ahead. We thank you for your continued support. The wine world is now back in full swing after the holidays and this month’s report reviews the past year on California’s bulk market and assesses what the new one may bring. Please turn to page 2 for more. It is hoped the state’s record winegrape harvest in 2018 will open up some exciting grape and wine options for buyers with an eye for opportunity, sensing now is the time to innovate, build new lines and generally inject some dynamism into the wine retail market. If you are a supplier with grapes or bulk wines that you think may interest such buyers, do get in touch with us. And if you are a buyer, a reminder that we have installed a new tasting area in our new offices at 201 Alameda del Prado #101, Novato, where you can sample bulk and bottled wines, so give us a call and we will gladly book you in. Ciatti is here to help you navigate the market in 2019 and beyond, whatever’s coming down the track. Keep reading our California and Global reports for the latest market insights, and we once again wish you a Happy New Year! January’s report looks back on an eventful 2018 in which the global bulk wine supply moved from a short to a long position, and offers some early pointers as to what 2019 may bring. The team at Ciatti is here to help you navigate the opportunities, and wishes you a very Happy New Year. 2019 is the final year of the 2010s decade and – as designated by the United Nations – the International Year of the Periodic Table of Chemical Elements, given that it coincides with the 150th anniversary of its creation by Dmitri Mendeleev. What are the key elements of the global bulk wine market as the new year gets underway? This month’s report attempts to identify them, country by country: of course, the common theme that unites them is a realisation that global bulk wine supply increased markedly the final quarter of 2018, the consequence of what the OIV has called “very high” world wine production through the year: Argentina and Chile returned more normal-sized crops, France, Spain and Italy’s harvests all exceeded their respective five-year averages, and California’s was a state record. This year’s winegrape harvest is likely to be the biggest in California’s history, at 4.3+ million tons. Winery capacity has become stretched. In some cases, doors were closed on more fruit from growers, some of whom are – because of ideal growing conditions in recent weeks – still picking or waiting on Brix levels. Since potentially harmful rain at the beginning of October, fall weather has been ideal, with warms days and not too cool nights allowing fruit to ripen. Despite a challenging year, most vines remained very healthy throughout the season, producing excellent quality grapes in – as it turns out – bountiful quantities. Chardonnay, Pinot Noir and Cabernet in particular seem to have come in heavy, through new plantings, helpful conditions or a mixture of both. The cooler than normal weather in August definitely allowed the crop to size up much more than envisioned; this is the biggest winegrape crop we have had since the 4.24 million tons in 2013. With the grape, bulk wine and case good markets all slow – and, more importantly, with winery capacity straining under the burden of the big crop – some overage has been left out on the vine or picked at discount prices. These discounted prices could allow wineries to profit from greater margin this year; some have seized the opportunity, but others simply lack the extra room or already have too much inventory. Ciatti Global Market Report: What Happened in the World of Wine This December? Due to big harvests around the world in 2018 – with crops in France, Italy and Spain not only recovering from a short 2017 but exceeding their fiveyear averages – the global wine supply has moved from a short to a long position. Prices are being adjusted downward as a result. Only Australia’s and South Africa’s bulk wine prices remain higher now than this time last year: suppliers in both countries are being warned that international competition is increasing. Challenging conditions during the growing seasons in Chile and Europe meant that the increase in output of good quality wines was not commensurate with the overall volume increase. Prices are thus falling fastest on the entry-level and generic qualities. Suppliers in South Africa – traditionally one of the main sources of generics for European buyers – are urged to be sensitive to the new global supply reality when pricing their 2019 wines. Global Market Report from Ciatti. The big harvests in France, Italy, Spain and California – contributing to what the OIV has called “very high” world wine production in 2018 – have cooled international buyer interest in the Argentinian, Chilean and South African bulk wine markets. Italy and Spain are competing with each other to be the most aggressively-priced, pulling European attention away from Argentina in particular, where there are plentiful volumes of good quality wines available. Your brand new California Report is here. Courtesy of Ciatti. Ciatti Craft Beverages dba John Fearless Company has Tennessee Bourbon Barrels available for purchase. Mash bill: +/- of 5% Barley, 10% Rye, 85% Corn. The barrels are available for self-pick-up out of either warehouse, or we could obtain a shipping quote to your location. If you have any questions, or would like additional information regarding the barrels (pictures, etc. ), please don’t hesitate reaching out to me directly! Ciatti Global Report - What Happened in the World of Wine This October? Your brand new Global Market Report is here. Courtesy of Ciatti. As the Northern Hemisphere harvests draw to a close, this month’s report analyses how each has fared and the implications for the global bulk wine market. What wine categories are long, which short, and what sort of prices can we expect to see moving forward? There are also updates on spring in the Southern Hemisphere. Click through for more. Overall, California is halfway through harvest: wineries in the Central Valley are between 55-75% complete, while those in the Coast are approximately 40-60% complete. The start of October brought overcast skies and patchy – then significant – rainfall to some areas, raising humidity concerns. Cooler than normal conditions through the growing season have elongated the harvest period so that a decent amount of thin-skinned, rot-susceptible varietals are still on the vine. The 2018 harvest is underway and this month’s report brings you some early insights into how it’s faring in each of the growing regions. Where are they in terms of harvest timing, quality, and volume, and what might it all mean for storage and the marketplace? Click through to find out more. What Happened in the World of Wine This September? The Northern Hemisphere harvests are ongoing. After intense heatwaves, the latter half of August brought cooler temperatures to France, Spain, Italy and California, prolonging hang time and helping quality and sizing, and – arguably – normalising harvest kick-off times after a couple of years where they’ve been early or late. There remains the risk of late-summer heat spikes or hailstorms, but at the time of writing all Northern Hemisphere harvests are on course to be average to average-plus in volume. Europe and California’s south Central Valley have been experiencing intense heat, which could restrict their final crop sizes slightly. However, Mother Nature permitting, the global bulk wine market’s direction of travel still seems to be towards lower prices and a more normal-looking availability situation in the months ahead. Click through for more. What happened in the world of wine this July? With a new harvest near, Europe’s prices are softening on some wines. Argentina’s prices are softening due to the peso devaluation and a quieter market than expected; demand in Chile isn’t feverish either. Confidence persists that Europe’s 2018 harvests will bounce back from last year’s shortfalls: the global picture is of a more ‘normal’ 2018 crop-wise – with a bulk wine market to match. July’s report drills down into the Central Coast, and further, into its constituent areas, analyzing historical production data by varietal, identifying trends and – looking ahead – concerns. The rapidly-growing rosé category is put under the spotlight. Ciatti’s craft beer provisions company, John Fearless, details its fresh stock of quality, used oak wine barrels that should interest winemakers. With the 2018 harvest on the horizon, there has been an uptick in suppliers seeking to move wine to free-up tank space. By June's start the growing season was running slightly behind due to a cool late spring. This month's report deep-dives into the growing areas to find out how each is faring, and asks: is Pinot Noir inventory building? There’s the potential in California’s vineyards for a 2018 crop at least average in size. With prices high, inventory big and retail sales disappointing, market activity remains subdued bar for a few exceptions in the premium areas. Click through for deep dives into Cab, Pinot Noir and Zin, the latest acreage stats and how they reinforce a feeling that Cab supply is outpacing demand. In general, activity continues to be slow on the Californian bulk market. With ample inventory and good options, many buyers feel able to wait to see how the 2018 crop develops before committing. Click through for the latest on the situation in the vineyards as well as deep-dives into Chardonnay, Sauvignon Blanc, and the growth of the ‘California’ appellation. This month Ciatti assesses how the Southern Hemisphere harvests are faring: will they alter the supply-demand balance? Also, click through for the latest on availability in the Northern Hemisphere and the lowdown on ProWein and China Food & Drink. The show season now moves on to Vinitaly, Ciatti Europe’s Florian Ceschi will be there and very happy to assist: call him on +33682763912 or email florian@ciatti.fr. 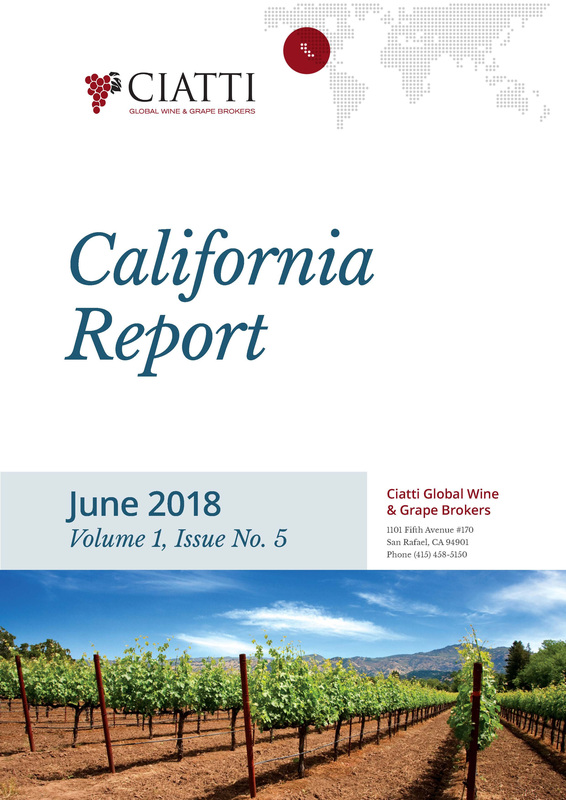 Love Ciatti’s Global Market Report but want to learn in more detail about the hot bulk wine opportunities California in particular has to offer? Click through to our inaugural California Report,which deep-dives into the Golden State’s market, identifying key trends and availability. The California Department of Food and Agriculture Preliminary Grape Crush Report was released today. 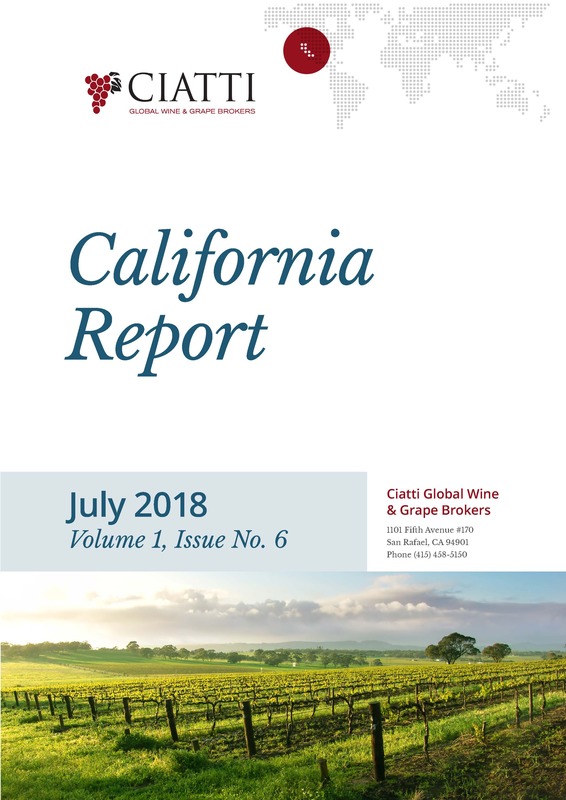 The information provided in this report gives understanding for the California wine and grape industry professionals. Information provided in this preliminary report shows the California Grape Crush Report crushed 4.007M tons. The report also reveals the overall crush was down less than 1% from the 2016 harvest, and the average winegrape price was up 1.8% to $775.09/ton. A more in depth look shows that Cabernet Sauvignon, Pinot Noir, Pinot Gris had their largest crushes ever. Ciatti’s experienced brokers will be available for further details, comments & analysis on the 2017 California Grape Crush Report. Please call 415-458-5150. The demand continues for Pinot Noir in all districts not only in grapes, but bulk wine too. The California Crush Report confirms that Pinot Noir grew 8,398 tons, the equivalent of 545,870 cases. This increased caseload is moving freely through sales channels. After four years of vineyard replanting and new vineyards developments around the state, the 2017 Cabernet Sauvignon harvest at 599,833 tons reveals that this variety will only continue to grow. The premium coastal regions dominated in the percentage increase 9.7% versus the Valley. Coming into August 2017 the crop was looking average or better than crop estimates, but continuous days of extreme heat contributed to a light crop. This is most evident is in Chardonnay tonnages from the Lodi down 18%, Modesto down 15%, and Fresno down 6% from the 2016 vintage. In 2017 the state recorded its second lightest Zinfandel crop in recent years down 13% overall to a total of 364,188 tons. Although 90% of the total production comes from the interior regions almost all areas saw a decrease in tons. Madera/Fresno who’s crop is almost entirely destined for a struggling white zin market dropped for the second year in a row to a total of 142,302 tons (-11%). Demand for red Zinfandel was also lagging with most of the state’s production coming from Lodi which totaled 124,181 tons, the largest decrease down 15%. Zinfandel appears to be losing acreage due as it struggles with profitability. As expected the average price per ton price for Cabernet Sauvignon is going up in Sonoma & Napa, 1.8% and 7.7% respectively. A major driver for the price increases can be contributed to long term grape contracts to securing premium wine supply. The San Luis Obispo (Paso Robles) / Santa Barbara 2017 tonnage increased 15.2%, the equivalent of 683,540 cases. All indications point to non-bearing acres coming into production. Chardonnay has not seen an increase in bearing acres for the last 10 years, holding strong at 91,300. There are 3,200 non-bearing acres poised to come on line soon though. Chardonnay saw a price increase of 11% from 2015 to 2016, and the price has risen another 4% to $921.77 per ton in 2017. Thriving brands and Coastal wineries looking to ameliorate cost of expensive Coastal fruit as way to reduce cost and improve margins. The last two vintages have seen historic highs on both grape and bulk wine prices on most all varietals in Coastal appellations. Given that the 2017 harvest yielded about in line with a 5 year average of 4M tons, there may not be the price relief if we had seen a bigger vintage. This will force certain wineries and brands to seek alternative sourcing from new appellations in order achieve a sustainable margin. In 2017 Bulk imports are up 26%, and imported case goods are up 4%, 2017 interior grape prices increased approximately 2% and interior tonnages decreased approximately 1% from 2016, the door opens wider for imports. January’s report looks back at an eventful 2017 in the bulk world, in which supply tightened and prices rose, and looks ahead to a 2018 filled with opportunities – and a few pitfalls. The team at Ciatti is here to help you navigate the twists and turns, and wishes you a very Happy New Year. Moving into late November many markets around the world are generally characterized by a slowness, activity-wise. In the Southern Hemisphere, the high price of any remaining 2017 stock and the prospect of the oncoming 2018 harvests have somewhat paused the markets in Argentina, Chile, and South Africa. In the Northern Hemisphere, buyers are assessing the French and Spanish crushes and – due to strong pricing, some scepticism as to the severity of the shortfall, or simply good inventory – holding off. This quietness could continue until next year’s instalment of ProWein on 18-20 March, by which time the 2018 Argentinian, Chilean, South African and Australian harvests will be better known. It now seems certain that 2017 harvest volumes in France, Spain and Italy have been significantly pegged-back by drought/unprecedented heat. Picking windows got compacted in a race to the finish. Wine prices in each country have responded, climbing steadily. California has also sizzled, but should still be on track for approx. 4 million tons. The global picture is one of rising prices and tightening supply. With harvests in the Northern Hemisphere just getting started, very high temperatures and drought are a cause for some concern in France, Spain and Italy. Heat has slowed the beginning of California’s harvest. With the upward pressure on prices across the world, France and California are becoming more reasonable from a pricing standpoint and there are opportunities to be had. We currently have a supply of recently emptied bourbon barrels being stored in a climate controlled warehouse available for immediate purchase. We have sourced barrels from the same distillery for about two years now, and have found their barrels to be of excellent quality; this is both from our internal inspection, as well as brewer feedback. These barrels are available for self pick-up, or we can get you a shipping quote to your place of business. The barrels are priced at $165/barrel, and a 10% discount applies to barrel orders in excess of 20 barrels. If you have any questions, please feel free to contact me directly. Attention is turning to the Northern Hemisphere harvests and whether or not they will be big enough to weaken the upward price trend occurring across the global bulk wine market. April frosts across Europe – as well as May/early June hail episodes in Spain – have put this in question and meant Chile is busy receiving sample requests. The focus of this month’s report is activity at ProWein 2017, a show which, like its previous installments, was vast and busier than ever before. Each with two halls of the massive Messe Düsseldorf, Italy (1,600 exhibitors), France (1,500) and home country Germany (1,000) dominated, with 600 Spanish and 400 Portuguese exhibitors in an Iberian hall and 120 Argentine, 120 Australian and New Zealand, 100 US and 100 Chilean exhibitors packed into the bustling International Hall. Overall there were 6,500 exhibitors (the most famous being singer-songwriter Sting, who popped in to promote his Tuscan winery) and a show record 58,500 visitors from 130 countries. As the bulk wine world turns its attention to ProWein in Germany, this month’s Ciatti report assesses the market activity for Northern Hemisphere wines in the weeks leading up to the show, and provides an update on how each Southern Hemisphere harvest is progressing. Mother Nature is proving a fickle mistress for two producer countries in particular. Come see us at ProWein: we’ll be in Hall 9, on stand A1. The Preliminary California Grape Crush Report released today shows 4,000,790 tons were crushed. The report reveals the overall crush was up 8% from the 2015 harvest, and the average winegrape price was up 14% to $789/ton. A more in depth look shows the standout varietals, such as Cabernet Sauvignon, Pinot Grigio, Petite Sirah, and Pinot Noir proved to be the large tonnage increases from the previous 2015 vintage. New plantings along the coast and the northern interior have produced the rebound yields. Ciatti Craft Beverage is looking for used Oak Foeders. All formats and sizes considered. We would like to thank Robert Selby our London based author for his insights, development and writing of this report. Robert worked at Informa as Deputy Editor on its titles Eurofood and World Drinks Report (2008-10), then as Beverages Editor (covering soft drinks, beer, wine and spirits) on its agribusiness journal Foodnews (2010-11). He completed a PhD in English Literature at the University of London in 2015, and has since worked as a freelance writer. Harvests in Europe are concluding and the trend is for volumes level with, or down by varying degrees on, 2015. The main ‘winner’ could be Italy, which enjoyed slightly better growing conditions than France or Spain. Overall, it does not feel like there is a surfeit of wine anywhere in the world right now. Ciatti Craft Beverage a division of the Ciatti Company is looking for 80-120 used white wine barrels. The Ciatti Company is looking for 80-120 used white wine barrels. July and early August have brought heat to the Northern Hemisphere. California’s Central Valley experienced some consecutive days of temperatures at 100ËF+ in early August; in France’s Provence and Languedoc regions, water reserves are low; in Italy, mildew and juice levels are a concern. Overall, however, temperatures have not been abnormal and notable problems with ripening have not been reported in any country. The growing seasons in France, Spain and Italy are two weeks behind schedule; Italy’s lateness is causing stress for Prosecco buyers in particular. As you will read, Prosecco is... READ FULL REPORT HERE. July 2016 is an exciting month for the Ciatti Global Market Update. With July's Global Market Update we are launching a new and improved, fresh and modern format. Inside we hope you will find articles that feature topics and information that are timely and relevant to your business. Please give it a close read as it is chock full of information! Due to a VERY active month of global bulk wine sales, sorting through South America’s difficult harvest and a very hot California grape market, this months report is somewhat abbreviated, but no less important! The harvest in the Southern Hemisphere is in full swing, and in some cases winding down. While reports of crop size are mixed among all countries, the biggest concern is coming from Argentina. It seems that the previously reported weather conditions have had a dramatic effect on harvest size. We are awaiting official numbers, but it is clear that this crop will be significantly smaller than previous years. Likewise, Chile is reporting smaller returns from the vineyard, and the outcome is similarly attributed to the El Nino affect during the growing season. Australia and New Zealand both report strong harvest numbers, but South Africa joins Chile and Argentina with lower volume expectations for the 2016 season. The Northern Hemisphere sales season is well underway. Sales of bulk wine in North America appear to be strong and moving at a faster pace than those of Europe. The strong U.S. dollar has certainly helped U.S. importers find opportunities around the globe. Despite receiving much needed rain this winter, drought conditions continue, albeit on a less severe scale. As we approach the harvest season in the Southern Hemisphere, weather conditions have some concerned in selected markets. Chile and Argentina both have experienced cold and wet springs and an early summer. Australia and South Africa are experiencing hot and dry summer seasons. Bulk inventory remains stable in most of the markets in the Southern Hemisphere, with some value-end wines increasing in stock. The suppliers in the Europe are reporting warmer than normal winter seasons, which has caused for some concern about the coming 2016 harvest. It is very early to make any predictions, as the frost season is still to come. The California crop report will be released later in the week, and most expect that the report will show a decline in volume from the previous year. The Preliminary California Grape Crush Report released today reveals the overall California winegrape crush was down for a second year in a row. 2015 came in 5% lower than that of 2014 at 3,699,242 tons. The average winegrape price was also down, by 11%, from 2014 to $680. However, after looking at the numbers it is clear that 2015 was a tale of two harvests, the Valley districts were up overall by 5% with pricing down yet the Coastal areas were down significantly, by 29% with pricing up in general. The Ciatti Company is the world’s largest and most comprehensive bulk wine and grape brokerage. Aside from its home base in San Rafael, California, seven additional offices around the world provide clients the kind of information and intelligence that today’s competitive global wine industry demands. As the 2016 year begins, the team at Ciatti wishes you and yours all the best in the coming year. Once again, we thank you for your continued support of our company, and we appreciate all of our clients, friends and business associates. Have a very happy and prosperous 2016. The 2015 year, like almost every year in the grape and bulk wine market, was a series of peaks and valleys. While supply was ample, and harvests strong in places like Chile and Australia, markets remained very active. Buyers from China and North America jumped in and took advantage of good pricing and broad selection of many varietals. For the most part, prices held firm, and grape markets look strong going forward for these two markets. All agree that the 2015 crop in California was smaller than it has been in recent years, and while we wait for the official February California Crop Report to give us an actual tonnage number, we know that the market has been very active, as buyers have moved to shore up supply. European markets have been active, with more supply coming from France and Italy, while the Spanish harvest declined slightly in volume. Overall, given current demand for wine throughout the world, the supply from 2015 began to move us back towards balance. The annual Bulk Wine Fair in Amsterdam is once again coming up on the calendar. Given the recent crop estimates in Europe, many are expecting the Italians will be making their offers in full force. All harvest estimates seem to be holding steady through the end of the growing season. Both France and Italy look to have taken in much more fruit than last year, while Spain and The United States seem to have taken a step back in volume. The lighter crop in the United States has caused some increased market activity, especially in the premium coastal regions. Activity in the Southern Hemisphere market is mixed. While Chile, Australia and New Zealand all seem to have good market movement, South Africa and Argentina continue to be a bit slower. Diageo continues to move towards exiting the wine business, as it was recently announced that their wine holdings in Argentina have been sold. The Ciatti Company is looking for used oak barrels for Clients. If you have quantities of 50 or more oak barrels available to sell over the next 2-3 months, please let us know. “Like sands through the hourglass, so are the days of our lives” was a quote television catchphrase from a long-running soap opera, which is appropriate for this global market update. With harvest in full swing in the Northern Hemisphere, buyers are truing up inventories and ensuring all programs will have good quality supply. The question at hand is: what varietals will be short, what varietals will be long, and from where? Meanwhile, all is now known about the 2015 Southern Hemisphere harvest, and suppliers are readying their wines for wine contract shipments and for the sampling of wines not yet sold. Overall, due to both supply and economic factors, we see a break in the logjam of over-supply, with buyers looking ahead to 2016 purchases. For avid readers of this global report, please pay special attention to the South Africa page, where there is another African country profiled, and to the Buyer’s Page on Alcohol products from our contributing partner, Andy Bivona. Another busy trade show season starts with the Bulk Wine Exhibition in Amsterdam November 24th and 25th. See you there! August has brought the heat to the Northern Hemisphere. All across Europe, reports are of very high temperatures, and growers, specifically in Spain, are concerned about the potential affect on crop size. Problems with ripening have been reported, and we will find out in the coming weeks if the European crop will be down significantly from last year. Similarly, in California, reports are beginning to come in regarding crop size, and early indications are for a smaller than average year in some areas of the state. Predictions vary by region, but the coastal regions appear to be experiencing a light harvest year. Official 2015 crop numbers are beginning to be reported in the Southern Hemisphere, with Australia giving an average sized crop. The supply side has not changed much over the past few years in Australia, with the premium areas seeming to be enjoying the majority of the profitability. South American suppliers welcome the recent snow, which would appear to relieve the water shortage conditions that have been in effect. The bulk market has been very active over the past thirty days, with buyers in Europe and North America taking advantage of great buying opportunities. Currency fluctuation continues to move pricing in both directions and buyers continue to search for the sweet spots. The market seems to be moving again towards balance, and given the hot weather in Europe and the anticipation of an average to slightly less than average forecast in California, it seems unlikely that we will be far out of balance for the remainder of 2015. July brings the “Dog Days of Summer” to the Northern Hemisphere. The Greeks and the Romans believed that the “Dog Days” were an evil time. Here’s how John Brady’s Clavis Calendaria put it: “The Sea boiled, the Wine turned sour, dogs grew mad, and all other creatures became languid; causing to man, among other diseases, burning fevers, hysterics, and phrensies.” While the wine does not appear to be turning sour, some suppliers in selected markets are moving wines at deeply discounted rates in order to make space for the coming harvest. Vintage predictions vary in the Northern Hemisphere, with the general theme being that most suppliers expect to have an average or slightly larger than average intake. The markets of the Southern Hemisphere remain active, with many buyers finalizing contracts in South America and New Zealand. Prices in South Africa on red wines have moved, with the help of currency values, into an area that makes them very attractive to buyers in Europe and North America. As currency fluctuation has become such a large part of the bulk wine market in recent years, all eyes are now on Greece during these Dog Days of Summer. We don’t expect to see boiling seas or souring wine, but we may see some “hysterics and phrensies” in the currency market in the coming weeks. The bulk market is moving at a normal pace for this time of year, and pricing movement will depend on financial markets and the actual size of the coming harvest in the Northern Hemisphere. It remains a good time to be a bulk buyer, but grape producers around the world are constantly evaluating their prospects, and plantings have significantly slowed in most regions. While the summer is just starting in the Northern Hemisphere and trade fair season is drawing to a close, thoughts have turned to earnest selling of new vintage wines and the upcoming harvest. The major fairs in Europe are the Bulk Wine Exposition in Amsterdam in November, ProWein in Germany in March, VinItaly in April, London Wine Trade Fair and VinExpo in Bordeaux, which is starting this week. While some expand and others wane, the opportunities to develop relationships and global business, remains at the heart of all of them. The Ciatti stand in Amsterdam, Prowein and London had strong activity as always, and Ciatti representatives at the other major and minor shows around the world report strong interest and growth opportunities for the global consuming public. It is clear, after talking to suppliers from all around the globe, that there is ample supply of bulk wine in the market. Discussion of lower-priced offers continues. Given the general oversupply, however, the trend towards higher and more premium priced programs has piqued the interest of buyers seeking to exploit the trend. While this remains problematic for larger supply areas, it confirms the trend toward “premiumization" around the world, and the rising prices for varietal wines in premium and super-premium growing areas around the world. Markets in the Southern Hemisphere remain active, with pricing in Chile, South Africa and Australia continues to be attractive to global buyers. Argentine suppliers continue to struggle and concentrate production has decreased in favor of wine. Upcoming crops in both Europe and the United States look decent so far, but as the old saying goes: “It’s a long way 'til harvest". Harvest is coming to an end in the Southern Hemisphere and most volume estimates remain unchanged. The total crop size for all of the Southern Hemisphere should fall short of the 2014 result. Argentina and New Zealand are experiencing the biggest declines in volume, while South Africa and Australia look to be very similar to the previous year. Chile has rebounded from a frost‐stricken 2014 crop, but looks like it will not reach the same levels as the historic 2013 harvest. Bulk market activity has been strong in many Southern Hemisphere markets, especially in New Zealand, as the small harvest has prompted buyers to take early action. Chilean prices have proven to be very enticing to international buyers, and many contracts have been closed over the past month. Australia is reporting strong export numbers, and suppliers at the value end of the market are experiencing growth in demand. Do you have winegrapes for sale in 2015 and/or beyond? The Ciatti Company is in the process of updating our winegrape inventory database and would like to know if you have winegrapes for sale for 2015 and/or beyond. We are constantly talking with and receiving new inquiries from winegrape buyers across the state and it is important for us to have an updated list of available winegrapes at the ready when speaking with these buyers. If you have winegrapes available for 2015 please call, fax or email this information to Jennifer Forrest in the Ciatti office. Jennifer can be reached at phone 415/458-8865, fax 415/458-5160 or Email jennifer@ciatti.com. We appreciate you thinking of Ciatti when you have the need to buy or sell winegrapes. The Harvest season is moving along in the Southern Hemisphere. Reports on volume are mixed, as Chile expects to have rebounded from a short 2014 crop, Argentina and New Zealand look to be down, and Australia and South Africa seem to be holding steady. Quality looks good in most regions, with some issues reported in selected markets. Bulk wine volume is balanced to slightly long in many Southern Hemisphere markets, but sales activity has been brisk in recent weeks. In the Northern Hemisphere, the French market continues to be very active, with prices holding firm on most varieties. Prosecco and Pinot Grigio sales have been strong from Italy and the falling Euro has helped with exports to the United States. California reports sufficient inventory for most items, and the continuing drought remains high on growers’ lists of concerns. The bulk market has picked up pace in California and older inventory is beginning to disappear. The bulk wine market remains active and the supplies of most varietals and generics from around the world are plentiful. This should make for some very dynamic conversations at the impending ProWein fair in Dusseldorf, which starts Sunday, March 15th. This fair continues to grow and has proven to be one of the most substantial events for suppliers and buyers alike. We look forward to seeing all of you at the show. Please come visit us at the Ciatti stand: Hall 9 A17. We will have bulk samples to taste from all regions. The Argentine government has revised the initial crush forecast numbers, confirming a harvest of 2.6 million metric tons. They have also communicated that they plan to subsidize the price of Criolla grapes with $0.75 per kilogram (US $0.087) and also give $1 (US $0.11) to the wineries that export generic white wines. They have also announced that 35% of grapes are required to go to be made into grape juice concentrate. All of these measures are intended to remove up to 200 million liters of generic white wines in Argentina, in order to keep the price stable and growers quiet. The price for other grape varieties is similar to that of last year, even though inflation continues to increase. Meanwhile, sales remain quiet. Do you have Winegrapes For Sale for 2015 Harvest Year or Beyond? We've include a quick FORM that you can use to fax over if you are interested otherwise feel free to get the information to us in any format that is convenient for you. Click here to access the form. The California grape crush report for 2014 was released on February 10th, and results were generally in line with expectations. The crop was down in volume from the record 2013 harvest, with reds retreating more than white varieties. Export sales are driven by the grapes coming from the San Joaquin Valley, and intake numbers were down for almost all varieties across the board in that region. We don’t expect a big change in market pricing due to the release of the crop report, as most producers had already estimated that the wine grape crop would be very close to the 3.9 million ton number that was reported yesterday. The French bulk market remains very strong, with prices trending in an upward direction on most varietals. The small crop in Southern France has caused many buyers to move quickly, and supply does not seem capable of meeting current demand. We have seen a lot of action in the Italian market, with Pinot Grigio and Prosecco wines now at the top of many buyers list of needs. Spanish producers are also reporting low inventory of 2014 wines and prices have remained stable. Harvest has begun in the Southern Hemisphere. Argentine suppliers continue to face very tough economic headwinds. Despite those issues, Good harvest conditions give hope for exceptional quality in 2015, and producers continue to have good product to market. The weather has been slightly less cooperative in Australia, with reports of mildew being made in some parts of the country. Producers are hopeful that the relative weakening of the Australian dollar against the US dollar will result in a boost in export sales. The harvest is not yet underway in Chile, but expectations are for a crop that will be larger than that of last year. The bulk market remains steady, with good opportunities for buyers in many markets. Suppliers and buyers alike are getting ready for what should be a very eventful ProWein in March. North Coast Overall the 2014 harvest will go down as one of the most bountiful in the history of Napa and Sonoma Counties. The last three years have produced historically large crops and that has gone a long way in replenishing some of the inventory in the market that had been depleted by the shorter 2010 and 2011 harvests. We continue to see average grape prices rise for most of the varieties in these areas with especially large jumps, 5-7 %, for Cabernet in Sonoma and Napa. The demand continues to be strong in Napa and Sonoma because case sales of wines over $15 per bottle has been strong for the last two years. There are some areas that are weaker than others though – with concerns centered on Chardonnay and Merlot. We believe the market is relatively balanced and that continued increased demand should work through the available inventory. (February 10, 2015, San Rafael, CA) – The Preliminary California Grape Crush Report released today reveals the 2014 winegrape crush was down 7.9 % to 3,910,178 from the 2013 record high winegrape crush of 4,245,852 tons. This is welcome news for the California wine industry which currently has large volumes of older vintage bulk wine available for sale. With the 2014 harvest the Rubired grape crop continues to remains marginally stable as most of these grapes have been planted under long-term contracts and yields remain large enough to be financially viable. While these grapes are very hardy, we are starting to see some quality issues in the areas that have higher concentrations of salts in the ground water due to the lack of underground aquifer replenishments. For these reasons we are not surprised by the volume decrease of 5.3%. 2014 volume was 242,204 tons vs 255,640 in 2013. In addition we saw a price point drop to an average of $301.48 vs. $327.41 which we are assuming was due to lower color and sugar bonuses. (February 6, 2015, San Rafael, CA) – The California Department of Food and Agriculture will release the Preliminary Grape Crush Report for 2014 harvest on Tuesday, February 10, 2015 at noon. The Ciatti Company will be supplying information regarding our interpretation and analysis of these results and will be available to provide comments and answer any of your questions immediately following its release. Please call Glenn Proctor at the Ciatti Company 415-458-5150 for remarks and insight. We will also be issuing a formal Press Release by 2 pm with further information and observations. Good morning and welcome to the start of 2015, at least on a calendar basis. 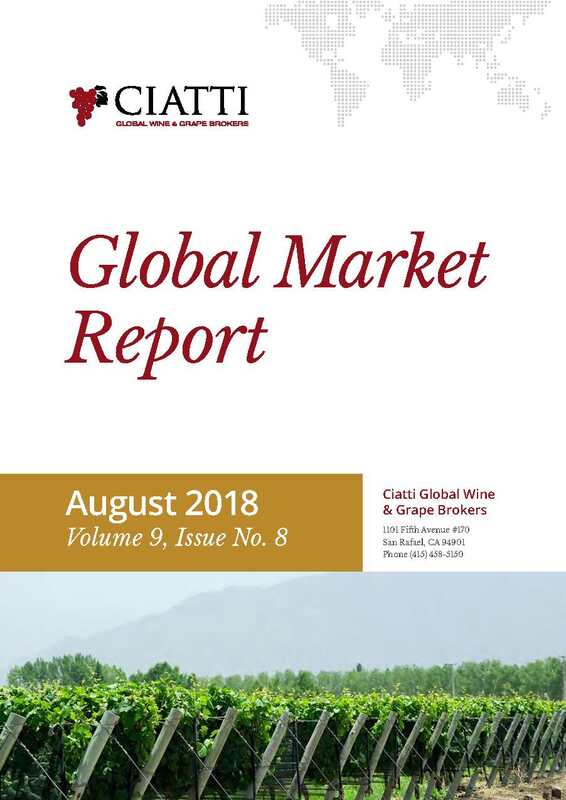 While we all tend to work harvest to harvest, the Ciatti World Report hopes to capture the ongoing fluctuations in the wine business from a supply side month to month around the globe! As we did last year, we would like to offer you this first report of 2015 as a primer to what may be next for us in the global wine business. The year of 2014 had many bumps and grinds along the way, with larger or perhaps larger than expected harvests in some areas of the world, while in a select few markets the supply stream was down a bit. The great news is that the wine business continues to grow year over year, as people continue to savor our wines the world over. Regardless of the growth in the Craft Beer and Spirit categories, we continue to attract drinkers who see the value in the lifestyle that wine offers them on a daily basis. We have often stated that we may have a bit of oversupply today (country and varietal dependent of course), but we also have increased consumption, just not at the level that can keep up with the volumes created between 2012‐2014. To that end, we need to drink our way through it collectively. Luckily, consumers of our wines are looking for us all to continue to produce quality wines for many years to come. We at Ciatti will continue to do our part in moving us towards a balanced position through brokering or drinking or both!! Finally, remember, this January 2015 World Report offers a consolidated view from the year that was, with some predictions for the year that may be. So, sit back, enjoy an early cup of coffee and start the year off with us! factor allowing France to regain its status as top producer is the size of the harvest in Spain. issue in Italy, as adverse weather conditions have caused for a very difficult harvest in 2014.
record crop from the previous year. despite some reports of frost, no major damage is expected from the larger production regions. those of you who will attend. Harvest is coming to an end in the Northern Hemisphere, and like the Southern Hemisphere earlier in the year, it looks to be smaller than the volume produced in the previous year. Spain and Italy both look to be sharply down on volume when compared to 2013, while France looks to rebound from the small crop of last year. Estimates from the United States are now coming in, and California looks to be down, as expected, from the record setting crop of 2013. Based on current estimates, the combined Northern and Southern Hemisphere crops should be much closer to the results of the previous five years average, compared to the much larger than average crop of last year. The bulk market for exporters continues to be slightly on the slower end of the activity spectrum, with plenty of stock available in most markets. Sales have picked up a little over the past thirty days, as harvest reports from the Northern Hemisphere have been less than enthusiastic in regards to volume. Given the smaller harvest globally in 2014, expectations are that the available wine inventories will move from a long position back towards balanced. It’s harvest time in the Northern Hemisphere, and early estimates compared to the previous year are beginning to be reported. The overall European harvest looks like it will be down, as Spain and Italy are both looking to take a step back from strong 2013 results. Predictions are for a lower than average crop in Italy, with some serious quality concerns. Spain is expecting a crop of average size, after the huge crop last year. France looks to be having a larger crop that least year, near the historical average. Most estimates have the California crop coming in smaller than last year, but perhaps similar to the 2012 crop. The drought in California does not appear to have had a major effect on this years’ crop, but many fear that continuing lack of rainfall could have a large impact on 2015 results. In the Southern Hemisphere, Argentine suppliers continue to struggle with difficult economic conditions. Opportunities for varietals like Malbec have increased, but the outside economic influence has many concerned about the future. New Zealand suppliers continue to enjoy strong world‐wide demand, and it seems that supply will allow for an increase in sales. All eyes in Australia are on the unfolding story at Treasury Wine Estates, as multiple bidders attempt to purchase the company. The 2014 Harvest is in full swing. The good news is that the crop looks to be solid but not a bumper crop. Given the current levels of wine the industry has in tanks, this is a positive thing. Activity continues to be the weakest for both grapes and bulk wine in the Central Valley. We believe a moderate crop will help to stabilize the market in the future, especially if we continue to see case good growth. Quality looks good so far, and harvest has been earlier than normal throughout the state. Our thoughts go out to our friends in Napa. Even though there was damage and loss, we are so grateful that there was no loss of life. We know you will all continue to move forward and prosper. With tanks full around the world, we decided to offer a brief respite from the detailed version of the Ciatti Global Market Update. If you are reading this in the Southern Hemisphere we hope you are settling in for a nice winter as the wines finish and ready themselves for sale. If you reside in the Northern Hemisphere we hope that you are well rested from your summer vacations and ready for an eventful harvest season. In the following pages, we hope that our direct and to the point, albeit abbreviated country comments will offer you some quick insight into the market as we see it today. As an added bonus however, Greg Magill has taken this opportunity to do a country by country round up of the World of Concentrate. We would like to thank you all for being loyal readers, and will bring you a full and detailed report in September. For list of prices click here! While the world has cheered, cried, yelled, screamed and held its collective breathe during the 2014 FIFA World Cup, we at Ciatti have not been immune to the fever of this year’s play. The verbal rivalry between countries has been, well, somewhat less than reserved and in some cases downright bitter……but then again, the most ardent of them was from Canada. The bulk market has been much the same. Inventories are, in general, available from around the world, so the competitive spirit is alive and well on the brokering front to get as many people the wines they need from around the world. Higher‐end wines have fared better during this time, while more commercial areas still have a ways to go in order to work through the 2012 and 2013 inventories that are currently in tank. We feel that while inventories are firm, the good news is that we continue to consume wine at an increasing rate, in spite of the surge of craft beers and spirits. "Soccer is a game for 22 people that run around, play the ball, and one referee who makes a slew of mistakes, and in the end Germany always wins." The summer has begun in the Northern Hemisphere, and the London Wine Trade Fair has come to a close. The annual fair has now moved to a new location in the heart of London, and this new venue seems to have sparked new energy to what had been a fading event. The Ciatti stand was busy for most of the three day event, and we thank those of you who had the opportunity to visit us during the show. It is clear, after spending several days with suppliers from all around the globe, that there is ample supply of bulk wine in the market. Most of the talk of oversupply revolved around the market situation in Spain. Rumors of low priced offers were confirmed, as many suppliers have very attractive offers on both generic and selected varietals from the La Mancha region. Markets in the Southern Hemisphere remain active, with Chilean and Australian pricing continuing to be attractive to global buyers. Argentine suppliers continue to struggle, and it appears that the government will again study ways to offer support to the market. The direction of the bulk market will now be dictated by the size of the coming crops in both Europe and the United States, and buyers and sellers alike now wait to see how those crops will size up. Predictions vary, and weather can change expectations quickly, but we know the next sixty days will be interesting. There is a strong level of optimism in the industry about future growth. But given the past two large crops and the expected average plus crop of 2014 the market for grapes and wine has slowed. These challenges seem to be greatest in the Central Valley where large amounts of bulk wine remain on the market. Three large crops in a row could lead to a significant short term supply correction over the last half of the year. As we look back at the first half of 2014,we can definitely say Cabernet Sauvignon isthe most in demand variety in the North Coast. Current grape inventories, especially in Lake, Mendocino, and Sonoma are verytight. In general terms the overall market for grapes has been as healthy as one could expect coming off of two back to back large vintages. Other varieties have also had some activity, Pinot Noir, Zinfandel, Sauvignon Blanc, and premium appellated Chardonnay have seen relatively strong demand. Transaction activity was brisk from mid January to mid April. The market has slowed somewhat as we seen expectations for an above average crop become more probable. We have seen buyers be more hesitant the last 4 weeks and unwilling to chase anything but Cabernet Sauvignon.No one knows how big the 2014 crop will end being at the end of the season – but the potential for another above normal crop has caused a slow in the early season activity. Also, harvest has the potential to be 2-3 weeks early! Cabernet Sauvignon: Strategies to source Cabernet Sauvignon from anywhere in the North Coast continues to dominate the headlines. Sonoma and Lake Counties continue to sizzle with lot after lot continuing to sell withlittle difficulty. After seeing little movement in the first two months of the year, 2012 Napa Valley Cabernet Sauvignon is selling in the $30 - $38 per gallon range with brisk sales and 2013 Napa Valley Cabernet sales are now getting going in the $26 - $32 per gallon. Merlot: For as hot as Cabernet is, one would think the Merlot market would not be as tepid as it is. There is still carry over stock from 2012 that can at least be used as a Cab blender, can it not? Sonoma County Merlot is readily available at $12-$15 and Napa Valley at $15-$18. Mendocino and Lake County are quiet butthere have been a few sales in the $7-$10 range. Chardonnay: Mendocino and Lake County Chardonnay sales continue to be sluggish with sellers today willing to take a $5 California appellation price in order to get some inventory moved. Sonoma County Chardonnay sales have really picked up since February with good volumes moving between $12 - $16. Pinot Noir: Two record harvests in a row? Another good crop on the way? So what? Pinot Noir continues to see demand from all appellations with Russian River and Sonoma Coast leading the way. Pricing has been in the $20-$25 range with some higher end barrel lots exceeding $30. For a buyer, the opportunity for Pinot Noir today looks to be in Carneros, where there is at least decent inventories to build on. Zinfandel: The two big harvests in a row have not been kind to the Zinfandel bulk market. Prices for Sonoma County Zin has been all over the board. Some larger lots moving in the $12 range and some higher end lots moving closer to $20. But there seems to be limited demand at the moment, soit will be interesting to see what happensover the summer as to whether this product can move at close to a decent price. The Central Coast has seen a lot of activity over the past two vintages. Entering the 2014 season,over 70% of the available fruit has been contracted. This year buyers have continued to look atCabernet Sauvignon, but many sellers are trying to bundle other varieties such as Merlot, Chardonnay, and White Riesling with Cabernet Sauvignon.Buyers have tempered their demand for Central Coast Chardonnay, with potential yields looking healthy and ample supplies on the bulk market. Pinot Noir was a hot item in the first quarter of this year, but activityhas slowed after set. Prices for Pinot Noir have continued to remain steady to date. One area we have seen demand growth in is District 6 (North Section of Central Coast AVA) , with more buyers moving into the area to source their Central Coast labels. Grape activity has slowed on the Central Coast, from earlier in the year. The reduced activity is a combination of both larger amounts of Bulk wine supply and the potential size of the 2014 crop. Bulk wine inventories on the Central Coast still remain in ample supply for most varieties. Most activity has been focused on Cabernet Sauvignon; however asother Coastal regions have seen large price increases, Central Coast supply remains available and prices for Cabernet Sauvignon have remained relatively stable at $12 to $16. Monterey Pinot Noir has also kept up with the action and moves in the $15 to $18 range, whileselect lots of Santa Barbara Pint Noir have commanded considerably more. Early year activity in Pinot Grigio hascleaned out most remaining inventories which had been selling in the $7 to $9 range. On the other side of the spectrum we have larger inventories of Coastal Chardonnay which moves steadily yet moderately at $8 to $12 and Merlot, which has had limited sales in the $7 to $9 range. Central Coast buyers seem to be cautious and watchful of storage space as we proceed towards another harvest. The Interior region vineyards have made it through bloom and appear to have an average set. Bunch counts by variety seem about average with some varieties showing slightly larger counts than last year in the Southern Interior. As you travel North, cluster counts tend to be slightly off versus 2013. Lodi, Chardonnay looks good and seems to have normal berry sizing, but Zinfandel seems to be significantly lighter and have lower cluster counts. Cabernet Sauvignon and Merlot look average at best but have seen some shatter as a result of a mid May heat spell. With summer temperatures approaching and the drought affects still uncertain, individual bunch size may struggle to have average weight. Buying activity has been slow with only a few buyers for select varieties such as Cabernet Sauvignon, Petite Sirah, Pinot Noir, Sauvignon Blanc, and Pinot Grigio. Most of the grapes are under long term contracts in the Valley and selling uncontracted grapes has been a challenge so far this year. Inventories of Central Valley varieties are readily available. Overall movements this year have been less than robust and these inventories are becoming "heavier" as we head into the summer months. We feel the effect of the two large harvests of 2012 and 2013. Wineries with full tanks have been absent from buying on the open market. This is causing concern and capacity problems for many speculative sellers. Specifically we have had demand for Pinot Grigio, Cabernet Sauvignon and other heavy reds, with moderate movement. Many other varieties including Muscat, Zinfandel and Sauvignon Blanc have seen sparse activity, surprising as those were the hottest items a couple of years back. Chardonnay sales have been slow in the valley, hurt by readily available amounts of coastal Chardonnay. An "average" valley crop overall would be welcomed and a hopeful reality given the current statewide drought conditions. Updated reports are coming in on harvests around the world. The government projections in Argentina have changed dramatically over the past month. Earlier crop reports had projected a 30% decline in volume, but new reports now estimate only a 6% decline from the previous year. In Italy, an updated harvest report now shows that they had a much larger than previously reported crop in 2013, and now holds the title of largest wine producer in the world. Chile continues to report a significantly smaller crop than last year, while Australia and South Africa are expecting average returns. The California bulk market has experienced some slowdown, especially in the central valley region. Inventories remain high on several varietals, and storage capacity will be at a premium. Crop estimate reports are mixed in California and it remains to be seen what effects, if any, the draught will have on the coming crop. Producers in much of the Southern Hemisphere are now in the last stage of their 2014 harvests. Reports remain unchanged out of Argentina and Chile, with both countries reporting substantial decreases in output from the previous year. Australia also looks to be slightly down, however, New Zealand producers continue to expect larger numbers than last year. South Africa is holding steady with reports for an average sized crop and good quality in most regions. The bulk market in the Northern Hemisphere continues to be varied, based on region. Spanish suppliers are struggling under the weight of very heavy supply. Spanish pricing has continued to drop over the past month, with many expecting further declines in May and June. Conversely, the French market is quite strong with limited supply, especially for white and rose wines. California producers are looking towards the 2014 harvest, and production capacity seems to be the greatest concern at this time. The annual ProWeinshow in Germany was once again a very well attended and successful wine fair. More than 48,000 wine professionals visited the show, and most of the 4,830 exhibitors had very active stands. Bulk wine buyers were active during the event, with many transactions being finalized over the three-day period. The Ciattistand was busy, and we thank all of you that were able to visit us this year. We look forward to seeing many of you again in London in June. It was reported in February that producers in both Chile and Argentina were expecting smaller than average harvest results. Updated reports confirm that volumes will be light in both markets. The bulk wine market has already reacted, with prices in both markets ending their recent downward slide, and now have now stabilized or even increased for some varietals. Australia and South Africa are moving through their harvest seasons, and reports are mixed regarding volume results. The intense heat, followed by rain, caused for a pause in the harvest in Australia. South African producers have also had some difficult weather conditions. Predictions in both markets are for crops that will be similar to, or slightly smaller than, last year. Despite the adverse weather conditions, both markets are reporting good quality for grapes that have come to the crushers.! Spain appears to be the one bulk market that is currently experiencing over supply. Pricing has been soft, and European buyers are finding good deals on many varietals. California finally received much needed rain in February, however, draught conditions remain, and most feel that the crop size will ultimately be determined by the coming frost season. The bulk market remains active worldwide, and both buyers and sellers are very excited about the upcoming ProWein show in Germany. We look forward to seeing all of you at the show, and please come visit us at the CiattiStand. We are located in Hall 2, and will have bulk samples to taste from all regions. After several months of a relatively low level of activity, the bulk market “broke out” in the middle of January. Buyers, perhaps concerned about potential supply issues in California and the Southern Hemisphere, ramped up their purchases over the past few weeks. Suppliers in California continue to look for drought relief, as 2013 proved to be the driest year for California in recorded history. There continues to be a debate about the potential size of the drought-affected 2014 California crop. Both Chile and Argentina are reporting lower crop projections, as frost and other weather issues appear to have damaged yield potential in both markets. Australia and New Zealand both could see healthy outputs, although some growers in Australia may face some issue caused by the recent heat wave. Suppliers seem to be gaining renewed strength, as demand numbers look promising in many markets. Chile has reported a record volume of exports in 2013, and current bulk pricing makes the Chilean market extremely attractive for red wine buyers. South African suppliers have a low level of carryover stock, and growers are hoping for a large harvest, as the weakening Rand continues to make South Africa a popular target for buyers from Europe and North America. European market reports are varied, as ample supply exists in Spain and Italy, while the demand is currently greater than supply in France. It appears that the bulk market has found a pricing floor in many markets, as prices are now holding, and in some cases starting to strengthen. Actual crop sizes in the Southern Hemisphere will certainly help solidify pricing in the short term, but the view for the long term continues to be a balanced market. With a deeper look into the grape crush report, certain themes emerge that are in line with what we’re seeing in the bulk wine and grape market as well as what we’re reading and hearing about in case good sales. Certain varietals stand out as being longer than others, with both Muscat and Chardonnay posting strong numbers again in 2013. Muscat Alexander jumps off of the page, with year over year volume growth of 60%. The additional California Muscat production could prove to be problematic, as its growth coincides with already existing international Moscato inventories and an overall softening of Moscato demand at the retail level. Analysis on pricing reveals that it was almost uniformly down in the Central Valley (see pricing for Districts #11 - #14, and #17), while pricing was uniformly up in all Coastal appellations (see districts #1- #8). This parallels what has been going on in each category, as lower cost wines from the Central Valley have been struggling due to higher cost of goods coming off the short 2010 and 2011 harvests. In the end, the quality of the 2013 vintage should be pleasing to both winemaker and consumer and the quantity in the Central Valley should help in the short term to keep imports for certain varietals at bay. What the future holds regarding the expectations for the 2014 crop will certainly make for a dynamic market after coming off two back to back record harvests. As 2013 comes to a close, most will remember the year of large crops across the globe and the market that began to shift back to the favor of the buyer. The Southern Hemisphere produced record crops in several markets, and with the exception of France, growers in the Northern Hemisphere experienced bountiful harvests as well. Buyers returned to the market in full force, taking advantage of pricing that had not been seen in recent quarters. Despite reports of potential global wine shortages, the market ends the year 2013 in a balanced to long position. Demand continues to be strong for wine in many markets, and wineries were able to weather the storm of higher bulk pricing in 2011 and 2012. Margins were squeezed, and many struggled with price increases. Hopes are that growth will continue with ample supply to meet future demand. The team at the Ciatti Company thanks you for your support during the 2013 year, and we wish everyone a successful 2014.